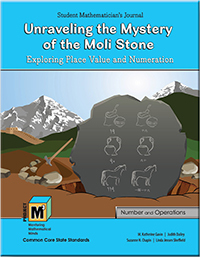 In this unit, Unraveling the Mysteries of the MoLi Stone, students explore our numeration system in depth. Often this number system that they use everyday has become so commonplace that they never pay attention to the underlying structure. Yet this structure is the essence of understanding place value. We call our system a place value system since each position or place has a value of its own. It matters not only what the digit is, but also where it is placed. Students begin by looking at patterns in our system and then work with other systems to help discover what constitutes a place value system and a base system. By analyzing the structure of each system and comparing and contrasting different numeration systems, they will gain a deeper understanding of place value and bases and be able to justify why our system is both a place value system and a base system. They will come to understand the importance of groupings and symbols because of the very nature of our system. In essence, they will gain a much deeper understanding of our numeration system, a system that they might have been able to use easily beforehand but never fully understood. This system is also known as the Hindu-Arabic System. In line with the National Council of Teachers of Mathematics (NCTM) recommendations, this unit seeks to engage students in meaningful explorations. To set the stage, students are commissioned as mathematicians on an archeological dig to uncover the mysteries of numeration systems etched on a stone similar to the Rosetta Stone. Their work on the investigations will lead them to knowledge they need to unravel the mysteries in the last chapter of the unit.